ZERONA® is a non-invasive body contouring procedure using the Erchonia® Laser Scanner. The multi-site clinical trial conducted by Erchonia® to validate the process focused on the abdomen, hips and thighs. The Zerona low-level laser therapy is approved for use on these target areas. At Laser Body Slimming, we have the patient lie on a comfortable table for 20 minutes on each side while the five lasers are applied to the target areas simultaneously. Thousands have tried this procedure, and have lost an average of 3.64 inches around the waist. Imagine going from a large to a medium, or a medium to a small, just by relaxing for forty minutes, a few times a week. 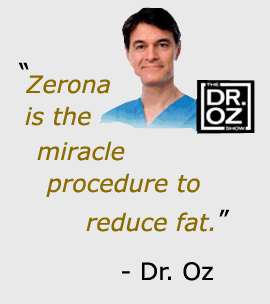 For a noninvasive, alternative medical solution to the traditional fat removal procedures and surgeries, consider use of the ZERONA® laser procedure. Contact Laser Body Slimming for more information. "You work out, eat smart and dropped 10 on the SELF diet. But you can't shake that last trouble spot. If you're fit otherwise -and willing to spend - new noninvasive methods offer a kind of "lipo lite" Exhibit A: Zerona, which uses low-level lasers, applied in multiple sessions, to create a temporary hole in fat cells so what's inside can leak out. But because the fat is broken down as it leaves the cell, it won't up your cholesterol. It’s safer than old-school lipo and a lot less painful (as in, not at all), says James Heskett, M.D. of New York City."